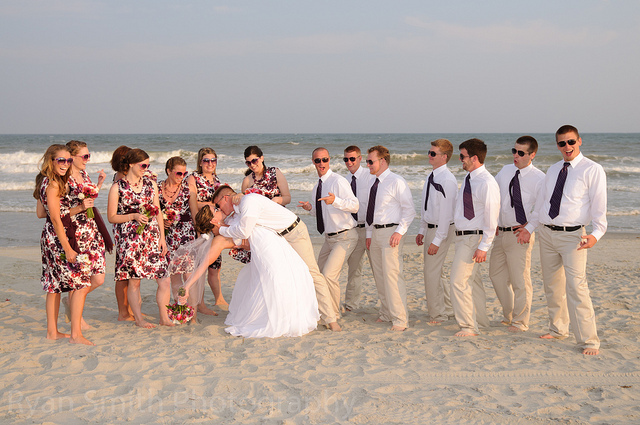 The beach is perhaps the ultimate setting for a wedding ceremony; indeed, when a couple chooses to tie the knot in such a beautiful, nature made venue, they often find that they have little need for decorations. The gleaming golden sun, the swaying, emerald-hued palms, the bronzed sands, and the jewel blue sky will in themselves serve as radiant adornments; coming together to provide the perfect backdrop to any wedding. Flowers. When a couple chooses to tie the knot in a natural outdoor setting, they can further adorn the exotic venue with the help of some tropical floral arrangements. Whether these florals take the form of water lilies, orchids, sunflowers, birds of paradise, or more traditional buds like roses and carnations, they are sure to illuminate and enhance the natural beauty of this venue. Tropical refreshments. At a beachfront wedding, guests are sure to be in the mood for a little tropical refreshment—preferably in the form of fresh fruits, tropical drinks (both alcoholic and otherwise), candies and cookies colored every color of the rainbow and baked in the shape of fish, starfish, exotic birds, etc. The couple also might opt for a custom made cake baked in the likeness of a beach, island or sea castle. Lighting. Granted, any beachfront wedding is sure to be doused in radiant sunlight—the most beautiful and naturally generated light source of all. Yet if the day turns out to be less than sunny, or if the wedding takes place at night, then the couple may wish to post tiki torches in a line across the beach; alternately, they might adorn surrounding palm trees with lines of rainbow-hued lights. Beachwear—Only Fancier! 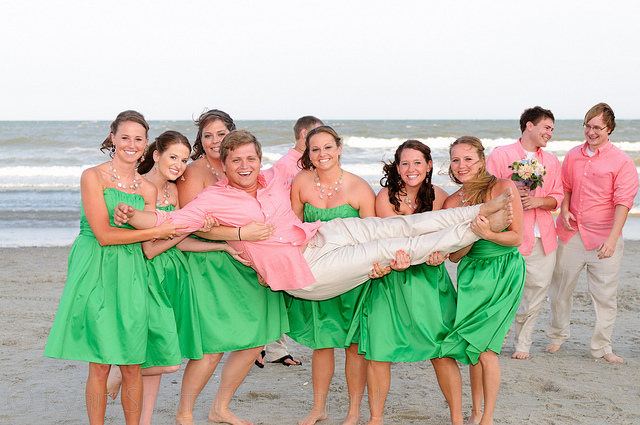 Even a couple getting hitched on the beach might not opt for bikinis or Bermuda shorts; they might, however, opt to wear lighter fabrics, like cotton and satin, and in vibrant colors like red, pink, and azure blue. Same goes for the ring bearer and the flower girl. Get them something in a more of a neutral color like grey or khaki. The flower girl can sport any little dress she likes, just make sure it fits the wedding theme! Tropical Music. Guests at a beach wedding will be primed to party—and they’ll be eager to dance to tropical tunes and jazzy island music. Tarps, Tents and Coverings. When planning an outdoor festivity of any kind, one always must allow for the possibility of wind, rain, and other forms of inclement weather. Be sure that you have some coverings on hand, to ensure that the ceremony can proceed as planned regardless of a change in weather. Barbecue! It just wouldn’t be any sort of a beach party without barbecue—and whether you’re cooking up hot dogs or steaks, you are sure to impress your guests with some tasty barbecued eats. Beach games. 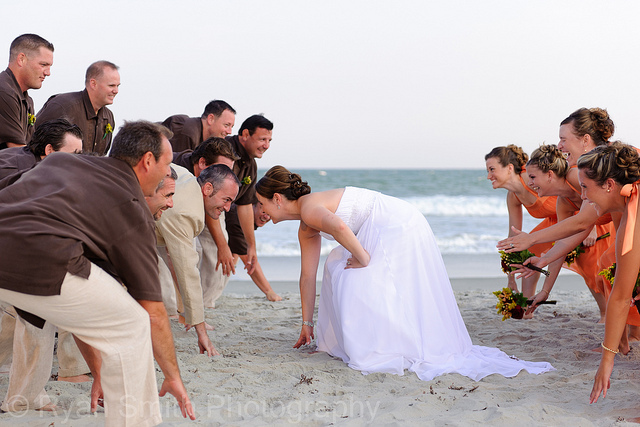 No beachfront wedding reception would be complete without a full round of beachfront games; activities that could range from swimming matches to beach volleyball, sand castle building contests to spirited sessions of Marco Polo. Tropical party favors. Hula dolls, miniature beach balls and adorable hula dolls might not be in place at many weddings—yet they are guaranteed prerequisites at beachfront ceremonies. Safety equipment. As beautiful and exotic as a beach can be, it can still be a bastion of heat and discomfort for children and older guests in particular. Keep plenty of sunblock, sunglasses and disposable hats on hand to serve their needs.